Rosie the Riveter would own a pink knife. Are you looking for a pink EDC (every day carry) pocket knife? Or just a pink knife that you can use to cut open boxes at work? 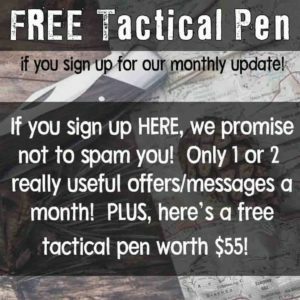 I know that KnifeUp and many other survival review sites are geared for men but, for this article, I’ll focus on female wants. There are many knives out there that are colored pink but, simply, some of them won’t stand up to long-term use. Cheap ones will last a few weeks to a few months before they’ll fall apart. Do yourself a favor and invest in a mid-level knife that’ll last for a few years. 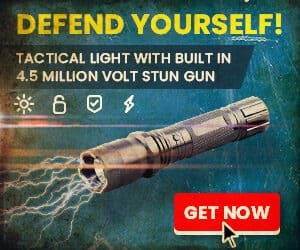 It’ll be sharper, easier to use, and, most importantly, safer. A dull blade is dangerous–ask any cook. This guide will discuss the 3 top-selling female pocket knives and make a recommendation as to which one you should get. These are all high quality, big brand knives that you can use for ages. If you are going to get a pocket knife for your girlfriend, I’m sure you don’t want to give her crap ;-). What Makes a Good Pink Pocket Knife? A good pocket knife must have a good handle, blade, safety lock, and fit. Handle – the handle can be made of wood, metal, plastic, rubber, or anything in between. Good handles offer enough grip that will protect your hand from slipping when wet. A good handle will also give you more control of the blade. Blade – the blade can be made of either stainless steel or carbon steel. Stainless steel is not as tough as carbon steel but it resists rust better. Most pocket knives are made of high carbon stainless steel, this gives you the best of both worlds. Safety Lock – for pocket knives, a lock is the device that keeps the knife in the close position when closed and in the open position when opened. This protects the user from having the knife pop open in her pocket. This also protects the user from having the knife close into their hand during use. The lock should be stiff but not too stiff where you will need two hands to open it. Most knives come very stiff and will loosen up after a few weeks of use. Fit – you would want a knife that fits well in your hands. A knife too large will be dangerous as you can slip and cut yourself. A knife too small will give you less precision. Female knives are usually smaller than male knives. All the knives here are quite small and light. The biggest feature of the Squeak is that it uses Austrian Bohler-Uddeholm’s N690CO steel. This is a special type of steel that is highly resistant to rust and yet very, very hard. The high-carbon steel contains Cobalt, an element that gives it additional structural uniformity. The steel is also heat treated so that the carbon atoms are aligned more tightly than normal stainless steel. N690CO is mostly used on high-end knives such as those made by custom knife makers and bench made producers. You won’t find any other knife in the Squeak’s price range that has N690CO steel. “The Squeak’s blade is held in the open position when cutting by a notched-joint at the knife’s pivot. When closing the blade, the notch generates resistance functionally similar to traditional slip-joint penknife and performs the additional function of smoothing the motion of the blade opening. Increasing control and comfort Spyderco designers add a deep finger choil, naturally jogging the index finger into a position on the underside of the blade directly below the thumb. Positioning the index finger in this choil blocks the blade from accidental closing when cutting and provides a grip position that allows the user to choke-up closer to the cutting edge for greater dexterity. The handle is FRN (fiberglass reinforced nylon) and engineered for user comfort whether in the hand, with ergonomic handle texturing, or in the pocket with a reversible tip-up deep pocket wire clip”. Okay, fine – it’s PURPLE, not pink. But it’s Kershaw’s latest offering for 2018! There are no pinks in their line this year! Kershaw is an Oregon based knife maker who has been in operation since the 70’s. They produce higher-end kitchen and survival knives under a different brand but the Kershaw name is still a great brand for the average consumer. The Scallion is a small EDC knife designed to last. It uses 420HC steel–which is nowhere as good as the S30V reviewed earlier but it isn’t bad either–that is rust resistant and hard. You won’t have to sharpen the knife a lot with 420HC. The blade comes razor sharp right out of the box and the handle is very grippy and strong. The blade is not as thick as the last model but it still works very well. The locking mechanism is very sturdy and it won’t open up in your pocket. You can easily operate this knife with one hand. Left-handers will enjoy that it is ambidextrous. This knife received 5 stars on Amazon. Most reviewers stated how it is a very good knife that has lasted them for years. The knife is made in the USA and, at this price point, is very satisfying for the money. You simply cannot go wrong with a Kershaw blade! Kershaw is an iconic name that is exceptionally well-trusted in the knife manufacturing world. You’ve read a bit about Kershaw earlier in this article, but wait, there’s more! The Chive is a super-convenient knife with a “smaller-than-2-inch” blade. It’s more than up to the task of slicing duct tape or cardboard boxes, and it even has an assisted opening system called “SpeedSafe”. The high-carbon blade is super strong and the bead-blasted finish makes it pretty easy to take care of. Anodized aluminum handles make the aluminum stronger, but it also allows for the colorization of the metal (in a scratch-resistant finish). 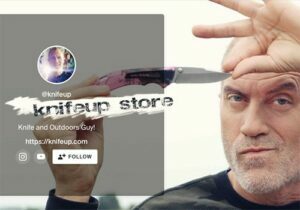 So, out of all 3 knives, which one should you get if you are looking for a pink pocket knife? (Or, which one should you buy for your girlfriend?). Seriously, all three knives are very good options. If you want to give her the best knife ever with insanely good steel that she can use for years without having to maintain, the Spyderco is your go-to knife. With its riveted design and durable steel, you can abuse that knife day in and day out without maintaining it and it’ll still perform as good as when you first got it. The Kershaws are tied for second place. And a VERY close race it is! They have insanely sharp blades that will last forever, and with the Kershaw name (much like Spydero) you don’t have to know everything about the knife – just that’s it’s made by Kershaw! You can view these knives as the BMWs of the knife world whereas the Spyderco is the Bugatti! That’s all folks. I hope you have good luck finding a good pink knife. If you have any comment, write them in the box below. You might also love my guide on the best pocket knife (of any color). People who go outdoors a lot usually pair a pocket knife with a machete, hatchet, or some other large cutting tool. This is because you can’t make a shelter with just a survival knife easily. Well the special lady in my life is taking a liking to knives. I guess my knife collecting hobby has been rubbing off on her. 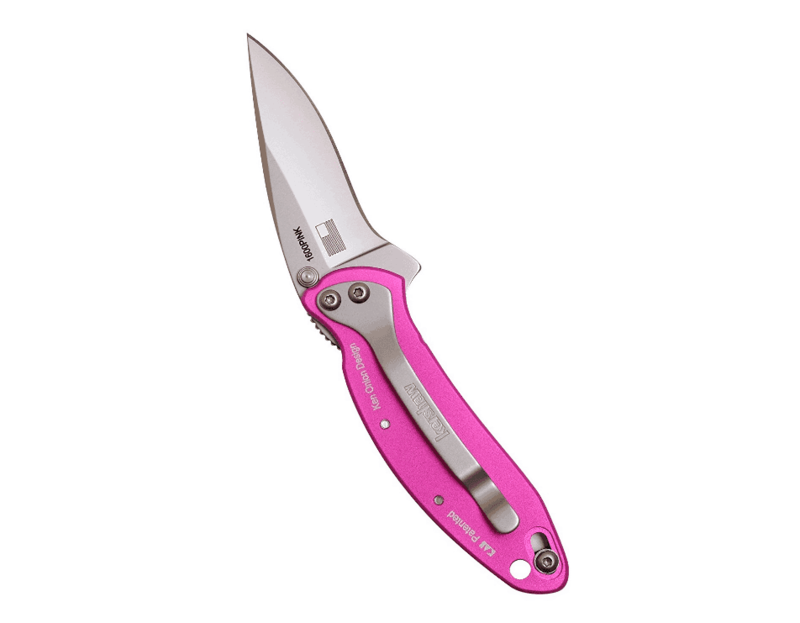 For a while she would covet a few of my liner lock and lockback folders but would then say, “… If they sold this knife in pink or purple I’d carry it.” She’s very feminine woman. Black G10 handles or walnut stained scales on a knife don’t go with pretty women and it sure doesn’t make them feel like a girl. After much searching I’ve been finding there are very few knives out there really geared toward women. It’s the same with guns. I settled on getting her a Buck Bantam 284 in the pink camo. She loves it and that’s what she’s been carrying most days. I also got her another folder that she absolutely loves by Elk Ridge knives. Good value for the money. I personally think that a pink pocket knife is brilliant. I do farm work on a daily basis and I have a pink knife. Knives should be personalized to the wielders preferences, and I like girly things; I always have. Pink doesn’t necessarily imply a level of wimpiness, the woman who uses the knife does. Obviously a woman who is going to go hunting and needs a knife to gut a deer is not going to have a pink knife, but to have a casual one for simple tasks is nice. You know how you can “focus on female wants”? By not assuming that you know what females want. If my boyfriend bought me a pink knife, I’d throw it right back at him and tell him to get me a real knife. The only thing a pink knife is good for is letting everyone else around you know that you’re a sissy woman who can’t handle a real knife, and has to have it dressed up all fancy to suit her delicate feminine nature. If that Spyderco Native is such a great knife, don’t detract from its worth by coloring it pink. 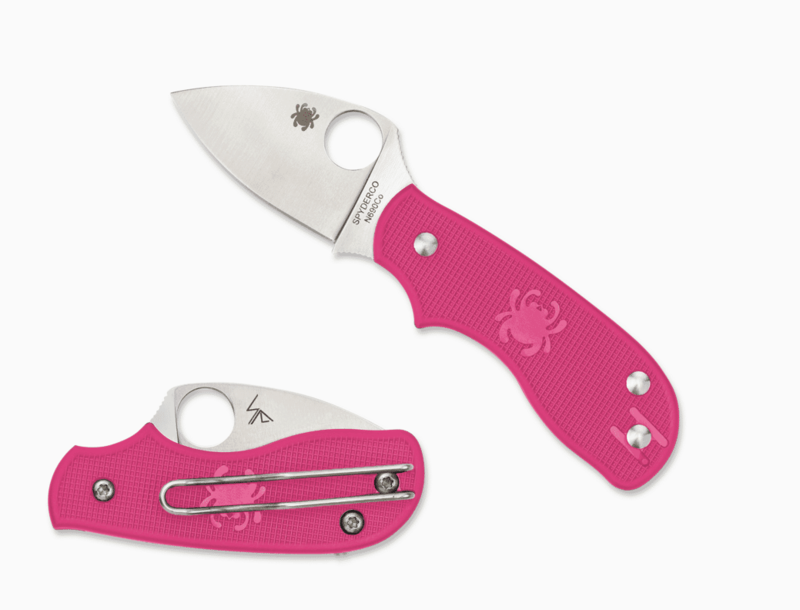 Sorry fella….but pink in a pocket knife???? 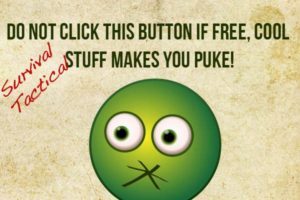 ?not for me…. blue,green, yellow , orange any color other than pink..